Social work professor Kevin Tan found in a recent study that addressing middle school students’ problems with bullying, fighting and attendance may be critical to ensuring they graduate high school on time. CHAMPAIGN, Ill. — Children who experience high rates of peer victimization or engage in problem behaviors such as fighting or absenteeism during seventh grade are at significantly greater risk of not graduating high school on time, a new study suggests. The study examined patterns of high school graduation and students’ experiences with victimization, physical fighting, school suspensions and absenteeism/tardiness during the fall term of seventh grade. Victimization risks were determined by the number of times students reported they had been threatened or had property stolen at school. 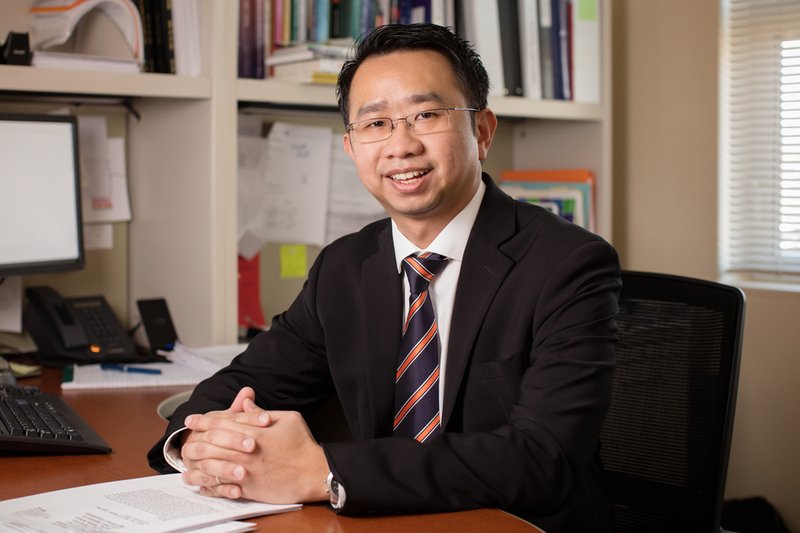 University of Illinois social work professor Kevin Tan found that while boys fell into three risk groups – low, moderate and high risk – girls were split into just two groups, low risk and high risk. Most of the boys in the study were classified as low risk as were most of the girls. Children in the high-risk groups experienced significant peer victimization, engaged in more problem behaviors such as physical fighting and were suspended from school more often compared with their low-risk peers, Tan found. Half of the boys and 46 percent of the girls in the high-risk groups did not graduate high school within six years. By contrast, 81 percent of the boys and 84 percent of the girls in the low-risk groups graduated on time, the data analyses showed. All of the children were participants in the ongoing National Longitudinal Survey of Youth, which began in 1997 and has collected data from participants 17 times since. Tan co-wrote the study with Ryan D. Heath, Aditi Das and Yoonsun Choi, all of the University of Chicago. Their paper was published in the journal Youth and Society. The study is believed to be the first to compare high school graduation rates across groups of students who experience different patterns of victimization and problem behaviors while in middle school. Attendance problems or externalizing behaviors such as fighting may be signals that children are experiencing peer victimization, the researchers suggested. While boys in the moderate risk group reported at least one victimization experience, had some attendance problems and engaged in some physical fights, 74 percent of these boys persisted in school until they graduated, compared with 50 percent of males in the high-risk group, Tan found. Tan hypothesized that although boys in the moderate-risk group may have grappled with some developmental issues, behavioral problems or peer conflicts, they may have developed coping skills along the way that enabled them to stay in school until they graduated – unlike boys in the high-risk group. Among other gender differences, Tan and his co-authors found that boys who experienced victimization but did not engage in externalizing behaviors had better school attendance and were more likely to complete their schoolwork than girls. The researchers found that about 25 percent of girls in the study who experienced bullying were more likely to be late or absent from school. “The existence of this pattern suggests the need for school personnel to screen for threats or physical fights and relational aggression among girls who miss a moderate amount of school but may not exhibit other forms of externalizing behaviors,” Tan said. The paper “Gender differences in patterns of school victimization and problem behaviors during middle school and their relation to high school graduation” is available online from Sage or the News Bureau.